There's something to be said for rear-wheel-drive sports cars. It simply makes cars like the 1999 Mazda Miata more fun than a barrel of monkeys. The Miata combines the fun of its spiritual predecessor, the British sports car, with Japanese reliability and modern technology. Since its introduction in 1989, these attributes have enabled the Miata to become a favorite of sports car enthusiasts everywhere. With more than 430,000 units sold around the world since then, the Miata is now one of the best selling sports cars built today. For 1999, Mazda's adorable little roadster receives a host of upgrades, including a thorough reworking of the car's exterior. 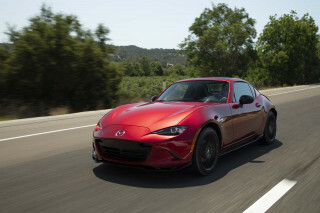 The new Miata has a larger trunk than first-generation models, increased chassis stiffness, and an improved four-cylinder engine that now produces a zippy 140 horsepower. From the factory, most British sports cars of the 1950s, '60s and '70s never made near that much power, but one thing they had in common with the Miata is rear-wheel drive, one of the essential elements of a classic British sports car. A typical vintage British sports car has narrow tires and rear-wheel drive — a combination that yields easily achievable oversteer. That is one of the most enjoyable traits of the Miata. It, too, has limits that are easily achievable. Want to induce oversteer in a corner? Simply apply the throttle in the proper gear and the tail swings out appropriately. Had enough fun? To correct your newfound rear-end swagger, merely remove your foot from the throttle. Try that in a Camaro, Mustang or Porsche, and you stand a good chance of winding up in a ditch. By comparison, with its more balanced 50/50 weight distribution between front and rear tires, the Miata has wonderful stability and is much more forgiving. For that reason, we are not sure why anyone would want anything larger than the 14-inch tires that come standard on the Miata. Sure, the available 15-inch wheels might look better, but those bigger tires push the limits of the car to a higher level — something we think detracts from the car's appeal. Not only do Miatas display more power and better manners, they eclipse those old British roadsters in another category: amenities. Our test car had the optional leather package that includes a host of interior upgrades, highlighted by leather seats and a masterful Bose audio system. Mazda's press materials describe the cab quite well: "The interior size is almost the same as that of the original roadsters and features a close, comfortable fit that, coupled with a low driving position, enhances the feeling of oneness with the car." That is Mazda's polite and eloquent way of saying the car is small. Still, this 6-foot-5-inch writer managed to fit. However, we can personally attest to achieving a "feeling of oneness with the car" on a 200-mile jaunt during our evaluation. During the drive, we noticed a quality that stands as our only major gripe with the Miata. High levels of engine noise sure can get on your nerves during extended highway jaunts. Granted, this car is not meant to be a long-distance tourer, but for the price, we wonder why Mazda cannot pack in a bit more sound-deadening insulation, plus a six-speed manual transmission, as is available in other markets. Such a move would both lower and tame those raucous RPMs, not to mention boosting fuel economy a bit. 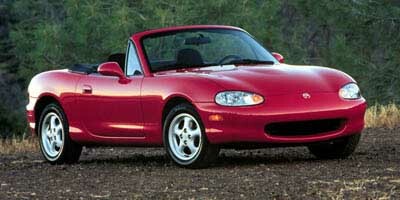 However, with a base of $19,770, the Miata is reasonably priced. Still, as options are added, that price creeps up into BMW Z3 territory quickly. Our test car came with the $3,975 leather package (as mentioned earlier), $900 air conditioning, and an $80 set of floor mats. With a $450 destination charge, our car stickered for $25,175 — a price that could also buy a Mustang GT convertible. Go figure. Interestingly, if you want the V-8 power of the Mustang, but the compact, classic roadster dimensions of the Miata, Monster Motorsports in Escondido, California, will shoehorn a small-block Ford V-8 under the hood. By doing that, you'd have a car that combined Japanese quality with the dimensions of a British sports car and a quintessential American Ford V-8. While that's not an altogether original idea (Did I hear someone whisper the word Cobra? ), we can only imagine how much fun that would be — perhaps something on the order of a barrel of monkeys on caffeine.